Scarlett 2i2 is the best selling USB audio interface in the world, and for good reason. It focuses on just three things; achieving the best sound, the fastest speed and the easiest experience. 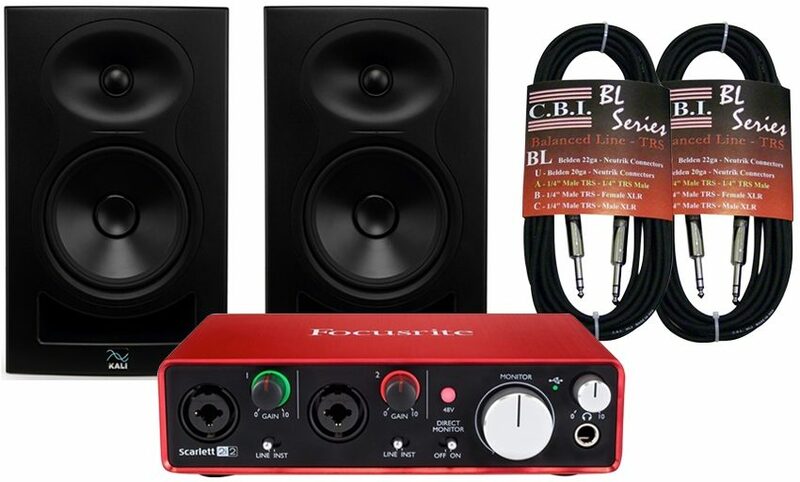 With Focusrite's Scarlett 2i2 your recordings will sound just how you want them. Two combination inputs with natural-sounding Scarlett mic preamps, line level inputs and newly-designed instrument inputs let you record anything you want. Even seriously hot guitar pick-ups. Two 1/4-inch balanced jack outputs let you connect to professional studio monitors, turn up the volume and totally immerse yourself in sound. The second generation Scarlett range is packed full of upgrades. Super-low latency* will bring confidence to your performance, letting you record and monitor with software effects in real time. Metal gain controls and a sleeker red metal chassis underscore its improved industrial design, built to go anywhere. The Scarlett range also now operates at sample rates all the way up to 192kHz, and the input channels have evolved too. The latest Scarlett mic preamp features a more even gain structure, so you can accurately set your levels, and the instrument input has also been completely redesigned so it can handle seriously hot guitar pick-ups. Finally, Focusrite have provided analogue protection circuitry across both the inputs and the outputs, to guard your interface against unwanted power surges. Overall: So, I'll be straight up - I was pretty sure my little mBox 2 from 10+ years ago was going to last forever...it didn't. Misha Mansoor was the primary reason I even looked into Focusrite - and rightfully so. This little box fit my needs perfectly - and has since made a fantastic replacement for my primary interface! I love the gain/clipping halos, which really sold me on it. I use this with Reaper, and have had zero problems getting them to talk to each other. So far, it has been flawless - even did a little reamp sesh to make sure everything would would correctly. It does! This box does what it "say it do" and does it well! For the price, you get quite a bit just *out of the box*, (and I haven't even downloaded the free stuff!). It works! Check it out! "One of the best out there!!" Overall: This unit is so cost attractive and satisfying, it should be considered a flagship of it's kind.